Lovelies in my Life : Etsy finds of the week! Etsy finds of the week! This week is all about kids. Monograms, heirlooms, and just really pretty things. All with the adored child in mind. I'm completely in love with this and it's something I'm really considering doing. 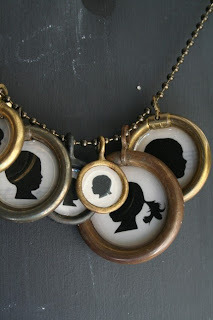 Send in a picture of your child's profile and Whitney will create a hand cut silhouette, the final result being a beautiful vintage cameo pendant. These pendants are antique brass rings in 3 different size options with the back covered in anything from antique sheet music to foreign language book pages (oh, how romantic). 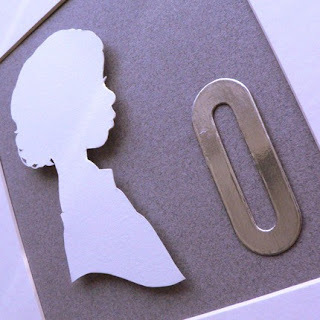 She can add text or even double side it with a picture of each child. Just too beautiful for words and something to cherish! By Luckymebeads. 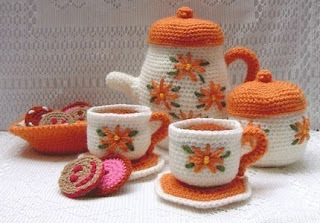 A crocheted tea set for your little lady. Seems like it's right out of a time capsule, along with a china lounging cat and a crystal ash tray. Okay, maybe not with those things in particular but it does somehow transport me to another time and place. Strangely, it's a very sweet and special lady that comes to mind and her astonishing home which was covered from floor to ceiling in extraordinary antiques. She was the grandmother of my best friend Raschika, also known as Tannie Gertie,... a lavish old lady who was reminiscent of the eccentric grandmother in the movie Great Expectations (Gwyneth's version and in all the best ways possible :). She was astonishing, beautiful, and very unique and she lived in (and never, ever left) a little palace of crystal, sweets, music, mirrors, and cigarettes. We loved to visit her and dance with her as we fueled our sugar high and toured the rooms of her home as our personal museum and even explored her jewelry box with wide eyes. More kid cameos, this time in a frame and on your wall. You can add their initial if you'd like. By Chirpstudio. 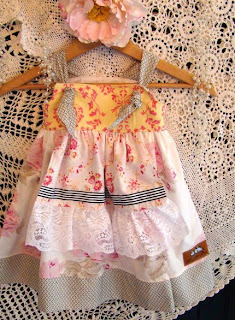 A lacey knot apron dress made by 3littlebirdsboutique. Too lovely! Thank-you for featuring my apron dress on your beautiful blog... what a pleasant surprise! Oh, I love your clothes on Etsy! Thrilled to have you visit my blog.